(Nanowerk News) RTI International has developed a revolutionary lighting technology that is more energy efficient than the common incandescent light bulb and does not contain mercury, making it environmentally safer than the compact fluorescent light (CFL) bulb. At the core of RTI's breakthrough is an advanced nanofiber structure that provides exceptional lighting management. Nanofibers are materials with diameters and surface features much smaller than the human hair but with comparable lengths. RTI's technology, which was funded in part by the Department of Energy's Solid-State Lighting program, centers around advancements in the nanoscale properties of materials to create high-performance, nanofiber-based reflectors and photoluminescent nanofibers (PLN). When the two nanoscale technologies are combined, a high-efficiency lighting device is produced that is capable of generating in excess of 55 lumens of light output per electrical watt consumed. This efficiency is more than five times greater than that of traditional incandescent bulbs. "By using flexible photoluminescent nanofiber technologies for light management, RTI has opened the door to the creation of new designs for solid-state lighting applications," says Lynn Davis, Ph.D., director of RTI's Nanoscale Materials Program. 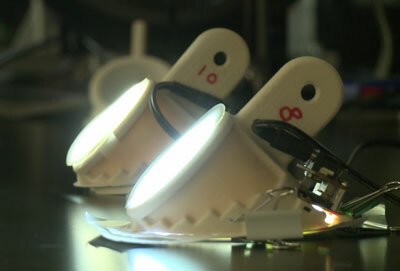 "This new class of materials can provide cost-effective, safe and efficient lighting solutions." Additionally, RTI's technology produces an aesthetically pleasing light with better color rendering properties than is typically found in CFLs. The technology has demonstrated color rendering indices in excess of 90 for warm white, neutral white, and cool white illumination sources. "Because lighting consumes almost one-fourth of all electricity generated in the United States, our technology could have a significant impact in reducing energy consumption and carbon dioxide emissions," Davis said. "The technology also does not contain mercury, which makes it more environmentally friendly and safer to handle than CFLs and other fluorescent lamps." RTI is continuing development of this technology and is actively pursuing commercialization opportunities in the marketplace. It is anticipated that commercial products containing this breakthrough will be available in three to five years.